This fried cabbage recipe comes together quickly and makes a great lunch! Be sure to brown the sausage nicely for extra flavor. 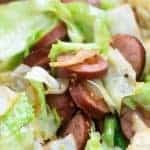 Slice the smoked sausage into thin rounds. Heat 1 tablespoon olive oil in a dutch oven or large, deep skillet over medium heat. Add the sausage to the skillet and cook, stirring often, until sausage is browned on both sides, about 4 minutes. Add the onion and garlic to the skillet and cook 3 more minutes to soften onions. Add the remaining tablespoon of oil to the skillet along with the cabbage and sprinkle with salt and pepper. Cook the cabbage, stirring constantly, until it becomes tender, about 10 minutes. The lowest carb smoked sausage I've found is Hillshire Farms Naturals, but any variety you love will work. Macros are calculated based on 1 carb per 2 ounces of smoked sausage.